The oil bull still managed to score another day of gains yesterday. A meager advance but still an advance, one could say. And be forgiven, as they would not have had examined the full picture. Are we just teasing you now? Come on, there can’t be possibly more to the story... There is. The scenario that we wrote about exactly to the day two weeks ago, has come to fruition. The implications are far-reaching. Time to share. Let’s take a closer look at the charts below (charts courtesy of http://stockcharts.com). (…) Yesterday’s session brought us another day of crude oil price gains, marking a fresh March peak. While not minuscule, the accompanying volume was still lower than the day before. The jury is still out but we lean towards the bearish implications thereof. Take a good look at yesterday’s candle. While it is yet another close higher, it was made on an even lower volume than the day before. This tips the scales ever more subtly in the favor of the bears – just like the fact that the body of yesterday’s candle was smaller than the Wednesday’s one. Such price compression is a telling clue of a strong undercurrent at play. That is, the proximity of strong resistances nearby: the previously broken rising green support line and the rising red resistance line. Yesterday’s close was yet another close below both of them. All in all, this increases the likelihood of an upcoming downward price reversal. Additionally, there are clearly visible bearish divergences being formed between the RSI, the CCI, the Stochastic Oscillator and the price of black gold (we marked them with grey rectangles on the above chart). It’s only the downward price move that is missing to complete them for all to see. (…) Note the two yellow rectangles which show that the upward move between the February 11 low and the last week’s peaks was quite similar to the first upward move after the December low. Such price action suggests that we could observe the last impulse wave according to the Elliott Wave Theory. It says that the first and the fifth waves are quite similar (in our case not in time, but probably in the length). If this is the case, crude oil can still hit one more fresh peak, which will precede a bigger move to the downside. Why is another fresh high possible? If we correctly marked the waves of the upward December-February move, light crude is currently forming the fifth smaller wave within a bigger fifth (marked on the above chart with 5?) wave. In other words, if all the above assumptions are correct, the last peak is still ahead of us. One more note regarding the markings and assumptions – within Elliott Wave Theory, the wave counts and markings can change as the chart progresses to be in line with the underlying price action. The market decides – the waves structure, type and precedence of waves. How high can the commodity go? 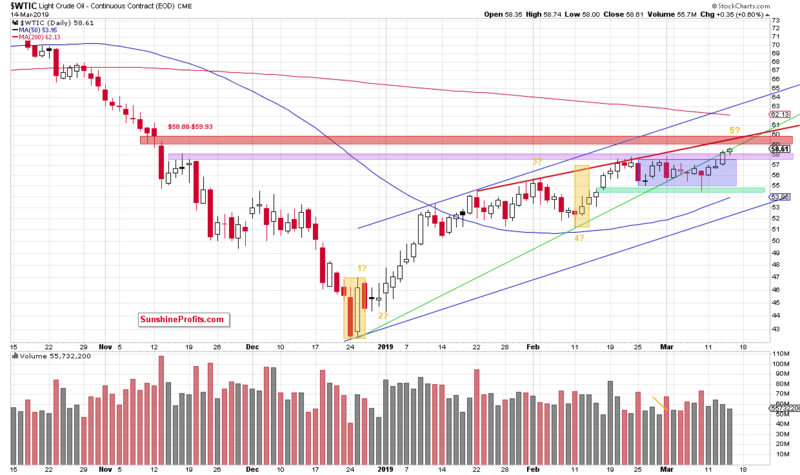 Light crude can test the above-mentioned red resistance line, which currently intersects the upper border of the purple resistance zone. Here, the size of the fifth impulse wave would be equal to 150% of the first wave. Nevertheless, if this area is broken, the next target would be around $58.74, where the fifth wave would be equal to 161.8% of the first wave, which is slightly below the red gap. In our opinion, after a potential fresh peak, we’ll still see a drop to at least the green support line based on December and February lows, but it seems more likely to us that we’ll see a decline to around $51.23-$52.30, where the mid-February lows and the bottom of a potential fourth wave are. Before we summarize today’s Alert, please check what was yesterday’s intraday high… yes, $58.74 exactly. On top, we’re seeing the first bear raid just now. Probing bulls’ defenses, crude oil currently trades at around $58.10 – fully erasing yesterday’s gains within a couple of hours, still before the U.S. session opens. Summing up, short position in crude oil continues to be justified from the risk/reward perspective as crude oil has reached very important resistance levels. 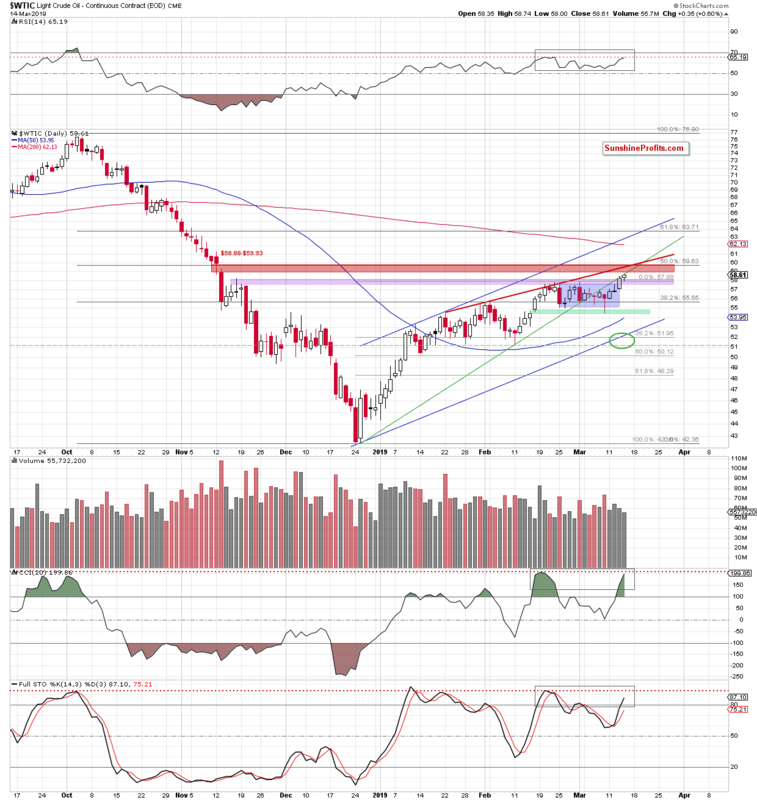 Combined with the progressively declining volume during recent increases, bearish divergences between the indicators and the commodity itself, and clearly visible oil bulls’ problem overcoming the previously broken green support-turned-resistance line increases the probability of a bigger move to the downside in the coming week. If you enjoyed the above analysis and would like to receive daily premium follow-ups, we encourage you to sign up for our Oil Trading Alerts also benefit from the trading action we describe. We encourage you to sign up for our daily newsletter, too – it’s free and if you don’t like it, you can unsubscribe with just 2 clicks. If you sign up today, you’ll also get 7 days of free access to our premium daily Gold & Silver Trading Alerts. Sign up for the free newsletter today!